Pete Lembo... no fan of noon games. Sat. Sept. 3 INDIANA (7:00) – ESPN3 at Lucas Oil Stadium in Indianapolis, Ind. So not all the times, but at least most of them. The South Florida contest I’m waiting patiently on, since that one will be the 2011 OTP Road Show, along with the season-opener against That School In Bloomington. Color me happy that the noon games are slowly dying, as that made the tailgating experience, student attendance, and atmosphere significantly reduced. 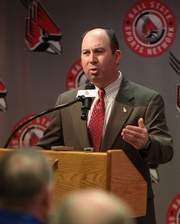 This is a step in the right direction for Lembo and the Cards, but there are still miles left to travel. Keep on eye on OTP over the next week or so as we begin to announce some exciting changes coming along, as well as the schedule for the 2011 preseason awesomeness. Go Cards!